2012 recruit Marc Hetnik, Jr., who is completing his senior year at Catholic Memorial High School, will follow the same path to BU as former Knights blueliner Garrett Noonan did, spending a season in the junior ranks with the Vernon Vipers of the BCHL. Hetnik, who was CM’s captain and tallied four goals and 16 assists this season, earned Boston Globe All Scholastic, Boston Herald Dream Team and ESPN Boston First Team All Star honors. When he arrives on Commonwealth Avenue, Hetnik will join former Vipers Noonan, Sahir Gill and Ryan Santana. Vernon, winner of two of the past three RBC Cup championships in Canada’s Junior A ranks, is rebuilding its defense. At least three starting blueliners from the past season’s team are departing. Hetnik’s father Marc Hetnik, was a forward on BU’s 1978 national championship team and scored 92 points in four varsity seasons. Former all Hockey East defenseman Bryan Miller and his Alaska Aces teammates claimed the ECHL Kelly Cup championship Saturday night with a 5-3 win against Kalamazoo in game five for a 4-1 series victory. Miller, who had been the hero in game two of the series scoring an overtime game-winner (recap, photo), is in his fourth season with the Aces and second time in the league finals. He led the team’s defensemen in scoring with a career-high 41 points and added another six points in the Aces’ playoff run. His former Terrier teammate, Brian McGuirk, is a forward for Kalamazoo. The Orange County Register profiled Nick Bonino, who spent most of his first full professional season with the Duck’s AHL affiliate in Syracuse. ► The Warrior Rink Rat Blog recently interviewed Hockey East Commissioner Joe Bertagna about how the advent of a Big Ten Hockey Conference might lead to restructing in other leagues. BU has announced its 2011-2012 regular season schedule with 27 Hockey East games and a seven non-conference games, including visits from Denver and Holy Cross, a New Year's Eve match at Notre Dame, the Beanpot Tournament and the third edition of Red Hot Hockey with the Terriers taking on Cornell at New York City's Madison Square Garden. In addition, the schedule includes a pair of exhibitions games, both at Agganis Arena: St. Francis Xavier on Oct. 1 and the U.S. NTDP U18s on Jan. 8. The full schedule follows below. Sat. 1 ST. FRANCIS XAVIER – Exhib. 7:00 p.m. Sat. 8 NEW HAMPSHIRE* 8:00 p.m.
Fri. 14 at Providence* 7:00 p.m. Sat. 15 DENVER 7:00 p.m. Sat. 22 HOLY CROSS 7:00 p.m.
Fri. 28 at Massachusetts* 7:00 p.m. Sat. 29 MASSACHUSETTS* 7:00 p.m. Sat. 5 at UMass Lowell* 7:00 p.m.
Fri. 11 MERRIMACK* 7:00 p.m.
Fri. 18 VERMONT* 7:00 p.m. Sat. 19 NEW HAMPSHIRE* 7:00 p.m. Sat. 26 vs Cornell^ 8:00 p.m.
Fri. 2 at Boston College* 7:00 p.m. Sat. 3 BOSTON COLLEGE* 7:00 p.m.
Thu. 8 at New Hampshire* 7:00 p.m. Sat. 10 at Maine* 7:00 p.m.
Wed. 4 at Harvard 7:00 p.m. Sat. 7 MERRIMACK* 7:00 p.m.
Sun. 8 U.S. NATIONAL UNDER-18 – Exhib. 7:00 p.m.
Fri. 13 at Northeastern* 7:00 p.m.
Fri. 20 PROVIDENCE* 7:00 p.m. Sat. 21 at Providence* 7:00 p.m.
Fri. 27 MAINE* 7:00 p.m. Sat. 28 MAINE* 7:00 p.m.
Fri. 3 at Merrimack* 7:00 p.m.
Fri. 10 MASSACHUSETTS* 7:00 p.m.
Mon. 13 vs Boston College/Northeastern# 4:30/7:30 p.m.
Fri. 17 at UMass Lowell* 7:00 p.m. Sat. 18 UMASS LOWELL* 7:00 p.m.
Fri. 24 at Vermont* 7:00 p.m. Sat. 25 at Vermont* 7:00 p.m.
Fri. 2 NORTHEASTERN* 7:00 p.m. Sat. 3 at Northeastern* 7:00 p.m. The Men’s Hockey team was among eight BU varsity teams recognized by the NCAA being among the top academically performing squads within their respective sports Details. A pair of BU's 2013 recruits were selected in this week's USHL draft. Brendan Collier, whose 30th goal of the season was the overtime game-winner that gave Malden Catholic the Massachusetts Super 8 Championship, was selected by Youngstown in the 7th round. Named All-Scholastic by both the Boston Globe and Boston Herald, he also participated in the USA Hockey Tier I, U16 tournament--leading the Greater Boston Jr. Bruins in scoring--and earlier this month played in the New England Pro-Am Hockey Pre-Draft Showcase. 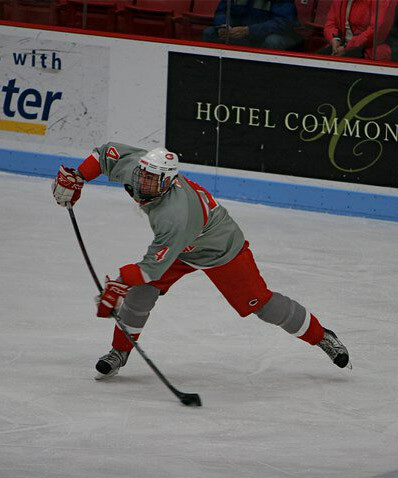 Danny O'Regan, who just completed his junior season at St. Sebastian's with a team-high 25 goals to go with 24 assists, was picked in the 8th round by Dubuque. He'll represent Massachusetts this summer at the National Select 17 Festival in Rochester, N.Y. O'Regan's father, Tom, co-captained BU's 1982-83 squad before playing in the NHL and Europe. His brother, Tom, Jr., is a 2011 commit to Harvard. ● Former Terrier teammates Bryan Miller and Brian McGuirk are on opposite sides for the ECHL Kelly Cup championship finals. Defenseman Miller, a 2005 Hockey East all star, is in his fourth season with the Alaska Aces and scored a career best 41 points (8-33). McGuirk was a captain of the 2007-08 Terriers and scored the overtime game-winner in the 2007 Beanpot championship game. He scored nine points for Kalamazoo this past season. ● Hockeysfuture.com has ranked rising junior Alex Chiasson as the Dallas Stars #3 prospect overall and #1 in the college ranks. ESPN Dallas profiled the power forward, who led the Terriers in scoring this past season with 34 points and was ninth in conference scoring. ● Former captain Kevin Shattenkirk has spent the past few weeks in Slovakia playing for Team USA in the IIHF World Championships. The St. Louis Blues' defenseman registered a goal and two assists in seven games for the U.S. squad that bowed out in the quarterfinals, losing to the Czech Republic. Shattenkirk was the NHL's top-scoring rookie blueliner with 43 points in 72 games. The Boston Hockey Blog reports that former Terriers Chris Higgins and Joe Pereira have signed to play for Tingsryds AIF in Sweden next season. Higgins, who scored 133 points in his BU career, played in Italy and for the ECHL Las Vegas Wranglers last season. Pereira was the Terriers' co-captain and led BU with 15 goals this past season. Both were members of the 2009 national championshp team. ● 2011 recruit Cason Hohmann's final USHL season is over as Cedar Rapids was eliminated in the Eastern Conference final of the Clark Cup playoffs by Green Bay. The forward from Plymouth, Michigan, had a 22-33-55 scoring line in 55 regular season games and was tied for team best with a +19. He led the Roughriders in playoff scoring with eight points. ● Hohmann's Roughriders teammate and 2014 recruit Anthony DeAngelo was drafted in the second round of the OHL draft by Sarnia. De Angelo, who was the youngest skater ever in USHL history, beginning last season at 14 and scored 15 points in 28 games, missed the final month of the season and the playoffs due to a fractured kneecap. The defenseman from New Jersey told a local newspaper his current plan is to return to the Roughriders next season. ● Defenseman Shannon Stoneburgh, a 17 point scorer for the Toronto Aeros of the Provincial Women's Hockey League, has committed to BU for 2011.